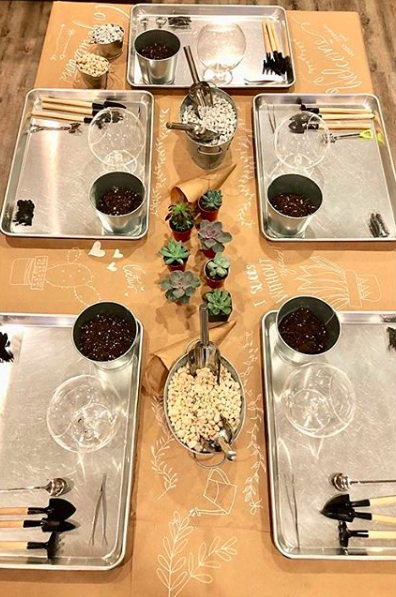 When you choose us over your typical paint and wine night you are choosing to participate in creating a special plant arrangement that can be used in any way you’d like. Terrariums can be used as a centerpiece for your living room, coffee table or a gift for a close family member or friend. Some customers sit down to create their DIY terrariums and think of loved ones that have just recently had a child or have just gotten engaged. This is the perfect opportunity to create a baby shower gift or an engagement gift. Here at the terrarium bar we have specific add-on’s that cater to babies, engaged couples and your basic home decor. Specialty terrariums like those created for baby shower or engagement gifts might include miniature ducks, ladybugs, house figurines and tiny fence posts. You have full autonomy over how many add-on’s you choose to use. While you add these decorations to your terrarium you will be asked to track the prices on each individual package and add them to your price list (given to you at the start of your project). You don’t have to have a rhyme or reason to why you are creating a terrarium with us. Most customers come in to our store with the intention of making a terrarium they really love to simply place on their window sill. Terrariums are beautiful and have a longer lifespan than a floral bouquet you would buy from your local grocer or florist. We welcome every idea you have and are more than happy to help you create your vision for your terrarium! If you’re more interested in buying separate gifts for your employees this year rather than planning a group activity we do offer gift certificates. Stop by the store to pick up your gift certificates. Once the gift certificates are given to the employees at your company they can either choose to come in and make their own terrariums, purchase any of the pre-made terrariums/potted plants or have us personally make a terrarium to their liking. There are instances where the client doesn’t have time to sit down and make something special for their loved one. In situations like this one we are happy to step in and create a beautiful terrarium for them. They can either sit with us while we create it or they can give us an idea of what they’d like, pick their plants and decorations and come back at a time that’s good for them. Often times we take clients contact information so we can get in touch with them when the piece is completed and schedule a time for them to pick it up in-store. From November to December we are going to have a lot of inquiries. The earlier the better in terms of booking. Please do not wait until last minute to book your outing. Private Event: The door will be closed and you will need a minimum of 12 people to book. If you’re interested in a private event please fill out the form below and we will get in touch with you as soon as possible with next steps. Private: Ability to close the door, no walk-ins allowed during your event.